In ActiveReports, in order to make your report output clearly visible during export or printing you can set character and line spacing. 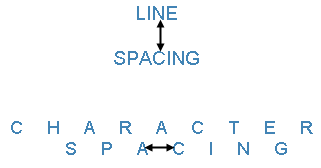 In order to use line spacing you must first set the MultiLine property for the control to True. On the design surface, click the control to display it in the Properties Window. In the Properties window, click the Property Dialog command at the bottom to open the control dialog. In the TextBox dialog, go to the Format page and set the Line Spacing or Character Spacing values in points. Note: You can also set the CharacterSpacing and LineSpacing property directly in the Properties Window. Line and character spacing is supported when you preview a report in the Viewer, print a report or export a section report in HTML , PDF and TIFF formats. In page reports and RDL reports, it is also supported while rendering a report through rendering extensions in Word, HTML, PDF and Image formats. See Rendering Extensions for further information on rendering extensions.